When most people think of Disney World, romance isn’t usually the first thing that comes to mind. Heat, crowds, thrill rides, and thousands of kids running around don’t exactly set the mood. And yet, Disney is also a place for everyone- this includes couples. Young couples, older couples who have left the kids behind, couples who don’t have kids, but choose to come to the parks anyway- there is something for all guests to enjoy. If you’re looking to snuggle up with your favorite person on an attraction, there are a few throughout the parks that should definitely work for a date night. Of course, every couple will enjoy different things, depending on if you’re more into thrill rides, dark rides, or shows. With the right attitude, any attraction can be romantic and fun (I know, that sounds incredibly cheesy). What’s more romantic than a soothing boat ride through a bioluminescent forest? 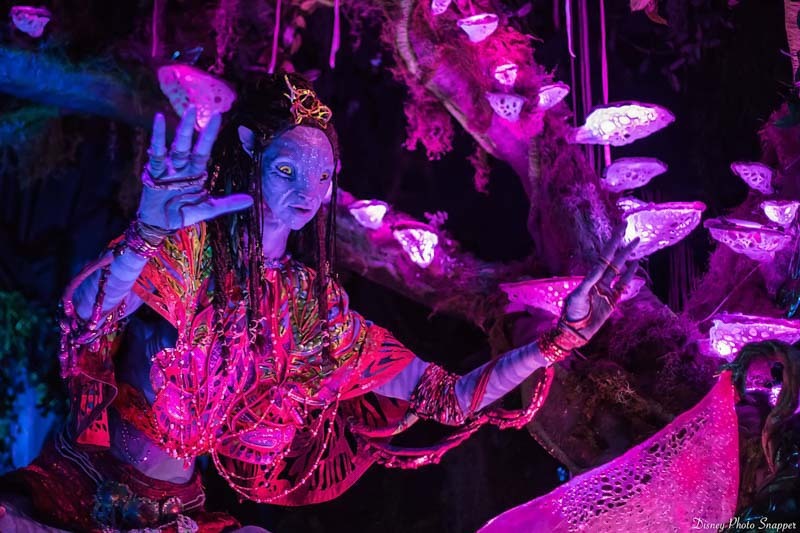 Na’vi River Journey, located in the Pandora section of Animal Kingdom, offers guests the chance to glide over a mystical, gentle river while taking in the beauty of a mysterious new world. On the way, you’ll encounter animal and insect interactions, glittering lights, sounds of the forest, and the impressive, life-size Shaman of Songs. Now that the popularity of this new attraction has died down a bit, it’s easy to get a FastPass. What’s not so easy is getting a private row for two people, especially on a busy day. However, no matter where you sit, this attraction still offers a beautiful, romantic experience. This is a classic Disney dark ride that’s bound to induce nostalgia, even if you haven’t seen Peter Pan or visited Disney World for a long time. It doesn’t matter if you’ve long stopped believing in pirates, fairies, and mermaids- this is a great attraction to ride with a partner. You can board a flying pirate ship and fly over the twinkling lights of London, before following the second star to the right and soaring through Neverland. With the combination of darkness, whimsical music, and scenes of adventure, this is the perfect ride for a couple to experience together. Just make sure to get some Fast Passes; this attraction still has one of the longest wait times in the park. If you’re with someone who doesn’t mind showing off their inner child, then Dumbo is a must-do for Disney-loving couples. The two of you can get in some quality cuddle time while sharing an elephant and flying high over Storybook Circus. You can take in the sights of the Magic Kingdom, and enjoy the wind on your face as you soar around in circles. This ride provides an even more romantic atmosphere at night, with the colors of Fantasyland brought brilliantly to life against the night sky. If you time it just right, you may even be able to ride during the fireworks- it doesn’t get much more romantic, or magical, then that. I’ve always thought there was something slightly romantic about this attraction. Yes, it’s supposed to be eerie, but the architecture and attention to detail enhance the effects of the ghostly residents. A couple can board a doom buggy and snuggle up while touring the mansion, visiting some creepy, yet beautiful scenes such as the library, Madam Leota’s seance, the waltzing ghosts in the ballroom, and the attic (just maybe don’t pay too much attention to the story of the murdering bride). Despite all the spooky spirits, I think this is a great attraction to ride during a date. After all, there aren’t a lot of opportunities to take your loved one to a haunted house, outside of Halloween season. Not many would consider this show romantic, especially with all the lively singing, fire dancers, and rope-swinging tumble monkeys. 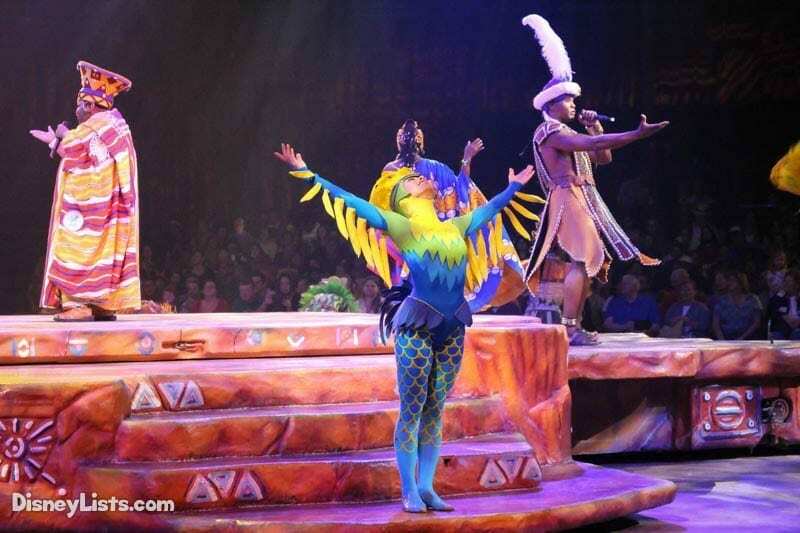 However, I absolutely live for the scene with the two dancers, dressed as a blue bird and a red bird, dancing to “Can You Feel the Love Tonight?” Watching the two actors express their feelings without words to the classic music just…does something to my heart every time, and I love watching that scene in the show with my husband. Not only is the dancing and singing amazing, but the aerial maneuvers performed by the bluebird always take my breath away. If you haven’t seen the show before, and are looking for something to see with a partner, take my word for it and bring your date along! Riding on a carousel with your partner is cute, no matter how old you are. Riding on the carousel at Disney, in the Magic Kingdom? Astronomically cute. It’s the perfect attraction to forget your worries, forget about looking cool, and forget about age. This is also a great way for a couple to blow off some steam and act silly- something that’s bound to happen all over Disney World. 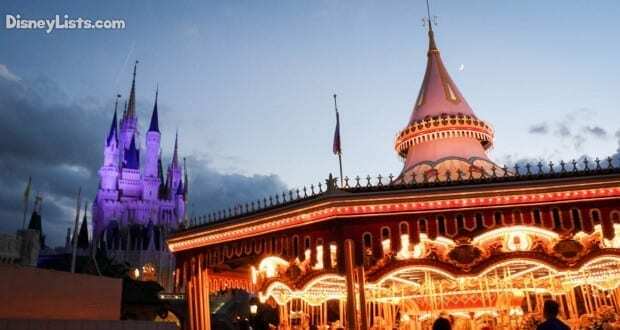 The iconic music that plays as you’re riding the carousel will hopefully provide some fun background music for your two-minute Fantasyland journey. Pick a horse, smile, wave to the crowd, and laugh with your other half. To me, Soarin’ is the most romantic attraction at Disney, and it’s for a totally biased reason- my husband proposed to me during Soarin’, while it was still the original California version. We were at the end of one of the rows, up in the air, and he quietly asked me (of course, he waited to give me the ring until we were safely back on the ground). I said yes, and now we never pass up a chance to ride Soarin’ whenever we’re at Epcot. Sadly, they changed Soarin’ Over California to Soarin’ Around the World, so while it’s not quite the same anymore, it’s still a fantastic ride that brings all those proposal butterflies back. There’s just something about being up high, breathing in the scents of jasmine and sea air, and gently swaying to scenes of the most spectacular places in the world. This is definitely my favorite romantic attraction at Disney, and whether you’re part of a couple or not, it should be on everyone’s must-do list.